The Witch Elm is a book to be sipped. Slowly. Maybe rolled around on the tongue a bit, it's that delicious. It's a scrumptious book full to bursting with lies, jealousy, decades old family secrets, and misconstrued childhood memories. If you're a reader who enjoys long, slow, luscious reads in front of a fire with a cup of tea or a bit of brandy, maybe raindrops pattering the window, this book is for you. "And there was Melissa, airy gold head and whirl of flowered dress in the opening door, a fairy creature from some faraway world of butterflies and dewdrops. . . ."
Readers may love or hate some characters, but French makes sure you know and understand every one. She's made them so real, their dialogue so tangible, you'll swear you're in the same room with them on the verge of joining in their conversations, sharing their reminiscing and good-natured joshing and bickering. ". . . I had never been cruel before, never, even in school where I had been one of the cool kids and could have got away with anything, I had never once bullied anyone. Finding myself doing it now gave me a rush of savage, breathless glee and of wretchedness . . . I had liked being a kind person and now I couldn't find my way back to that . . ."
After a lengthy convalescence in hospital, he returns to his ancestral home, Ivy House, to recuperate further. There the reader meets the cousins, Leon and Susanna, and elderly Uncle Hugo who lives and works at Ivy House as a genealogist by virtue of a bequest from the previous owners. "The high-ceilinged room jumbled all the voices into gibberish and the whole thing had a precarious, unmoored feel to it, a knees-up in some Blitz-time basement as bombs whistled overhead, the hilarity brittle as an ice sheet and on the verge of skidding wildly out of control . . ."
Things turn downright contentious when the subject of Uncle Hugo's will is brought up by Cousin Leon who also pressures Toby to name his date of departure. Suspense begins to unfurl and family ties are further complicated when a human skull is found in the garden. "The skull lay on its side in the grass, between the chamomile patch and the shadow of the wych elm. One of the eyeholes was plugged with a clot of dark dirt and small pale curling roots; the lower jaw gaped in a skewed impossible howl. Clumps of something brown and matted, hair or moss, clung to the bone." Later, human remains are discovered in the hollow of that tree. When they are identified, a foggy past returns, and Toby becomes victim, witness, suspect, and maybe even killer. Be warned. The Witch Elm is a hearty read. Long chapters and long sentences, but smooth as silk and so vividly written, you'll want to read them more than once. Don't hurry through this book. Take your time, enjoy the lavish comfort of Ivy House, bond with Toby, girlfriend Melissa, Leon, Susanna, and Uncle Hugo. 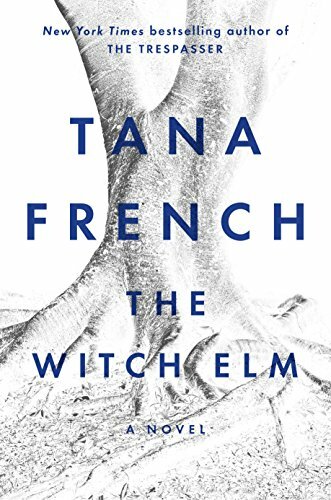 This is Tana French's best book yet.